Before Gonzaga took up more or less permanent residence in the high rise that is the NCAA Tournament bracket, the Bulldogs had to get past the doorman. And before that, they had to find the neighborhood. The very notion seems so quaint now that the Zags are entering their third decade of consecutive NCAA appearances – and, often as not, winning the West Coast Conference Tournament and the automatic bid that goes with it is but a goal and not a necessity. In fact, no one truly understands the implausibility of Gonzaga’s basketball self-actualization as well as those it bitterly escaped. And never was it quite so bitter as it was 25 years ago. Jeff Brown still carries the taste around with him – even as he relishes the best takeaways from his time at Gonzaga and especially that senior year. Teammates who remain his closest friends. Being part of the first Bulldogs team that won a WCC regular-season championship. And making the first postseason appearance in the school’s Division I history. 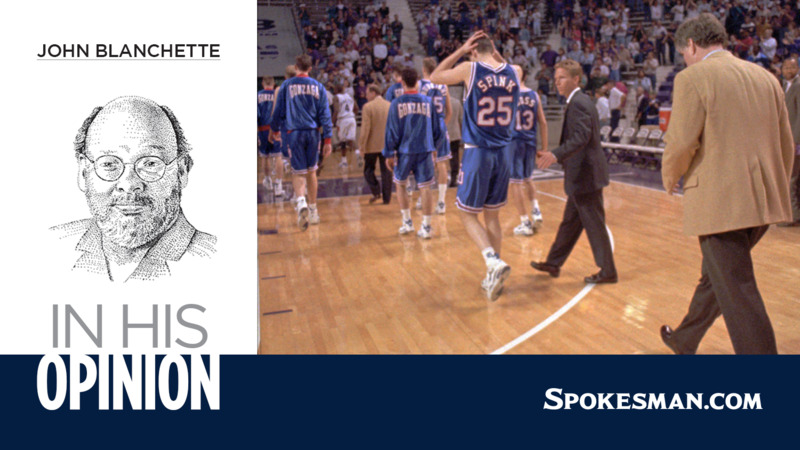 Big rivers begin as mountainside trickles, and while the watershed moment of Gonzaga’s charge into national prominence is distinct – the Elite Eight run of 1999 – it’s less clear just when the first drops began to pool. The Zags’ emergence as a 20-win program in the 1990s is obviously significant, along with the bite-the-bullet moment that birthed it. That was former coach Dan Fitzgerald’s decision to redshirt a promising group of transfers (Eric Brady, Jarrod Davis), walk-ons (Geoff Goss, Matt Stanford, Marty Wall) and a single scholarship freshman (Scott Spink) for the 1989-90 season – and endure what would become an 8-20 slog on game night. The next fall, Brown – the Greater Spokane League career scoring leader during his days at Mead – returned to Spokane after an unsatisfying freshman year at Washington, and sat out while the Zags bounced back to the .500 mark. The program would fail to win 20 games just once in the next five years, after not having done so since 1967. In 1992, in fact, the Zags got within three points of the NCAA breakthrough. “We played Pepperdine in the WCC final – Doug Christie and those guys – and we were up probably for two-thirds of that game, playing well, and end up getting beat,” Brown recalled. “The rumor was we’d be in the NIT playing Kelvin (Sampson) and Washington State down in Pullman, and I remember Fitz coming in and telling us we didn’t get the invitation. But pledges like that have a lot of moving parts. The 1992-93 Zags finished a game behind Pepperdine in the WCC thanks to four losses by a total of eight points – and lost another two-pointer to Steve Nash and Santa Clara in the tournament semifinals. But in 1993-94, Gonzaga won the WCC by four games over Pepperdine and San Francisco, in the old 14-game round-robin. Victory No. 21, over Loyola Marymount, came in the tournament’s first round at what was then known as Toso Pavilion on Santa Clara’s campus, setting up a semifinal date against San Diego. Which, ominously, had beaten GU in the regular season finale at USD. Even more ominous: Brown going to the bench with his second foul barely seven minutes into the game. But mostly, the Zags were playing in quicksand – shooting poorly, rebounding worse. They fell behind by 18 points in the first half, then dug in with a press and lengthened the game with some strategic fouls – except that four players would foul out, including Stanford, who scored 25 points. Gonzaga closed the gap to six points with two minutes left, but drew no closer in an 85-73 loss. “It was just one of those games, one of those days,” Brown said. But even if Mama warned you there’d be days like this, she never said anything about them haunting you for 25 years. This time, however, there was some consolation: the Zags’ romp through the WCC regular season was enough to earn a spot in the National Invitation Tournament against Stanford. And the Bulldogs decided to look at it as an opportunity and not an insult. Brown may have had more motivation than anyone. Which made his 27 points and Gonzaga’s 80-76 victory feel that much better. The Zags’ season would come to an end five days later in a two-point loss at Kansas State. And 51 weeks later, Gonzaga would make its first NCAA appearance – a first-round loss to Maryland – after a Zags team that had started WCC play 0-6 stormed through the conference tournament on the back of a stunning shooting exhibition by John Rillie, who had tasted the disappointment the year before. It mirrored, in fact, the feelings Brown had when he and his former teammates rendezvoused in Phoenix two years ago when theZags finally crashed another party: the Final Four. “There were, like, 25 us – meaning, wives, kids, everyone – just from our era,” he said. “And that’s the best part of it. We still talk to each other nearly every other day. Guys have gone on to successful careers and are still incredibly tight. And there’s the feeling of having done something – first to win the (conference), first to go to the postseason, and just doing a nice job of representing Gonzaga. Published: March 8, 2019, 5 a.m.